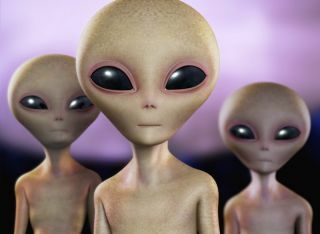 Artist's impression of intelligent aliens. Many other planets throughout the universe probably hosted intelligent life long before Earth did, a new study suggests. The probability of a civilization developing on a potentially habitable alien planet would have to be less than one in 10 billion trillion — or one part in 10 to the 22nd power — for humanity to be the first technologically advanced species the cosmos has ever known, according to the study. In 1961, astronomer Frank Drake devised a formula to estimate the number of extraterrestrial civilizations that may exist today in the Milky Way. Adam Frank and co-author Woodruff Sullivan of the University of Washington were interested in the odds that intelligent aliens have ever existed anywhere in the universe. So they tweaked the famous Drake equation, coming up with an "archaeological version" that doesn't take into account how long alien civilizations may last. Frank and Sullivan also incorporated observations from NASA's Kepler space telescope and other instruments, which suggest that about 20 percent of all stars host planets in the life-friendly, "habitable zone," where liquid water could exist on a world's surface. The researchers then calculated the probability that Earth was the universe's first-ever abode for intelligent life, after taking into account the number of stars in the observable universe (about 20 billion trillion, according to a recent estimate). "From a fundamental perspective, the question is, 'Has it ever happened anywhere before?'" Frank said. "Our result is the first time anyone has been able to set any empirical answer for that question, and it is astonishingly likely that we are not the only time and place that an advanced civilization has evolved." But this doesn't mean that there are lots of intelligent aliens out there, just waiting to be contacted, the researchers stressed. "The universe is more than 13 billion years old," Sullivan said in the same statement. "That means that even if there have been 1,000 civilizations in our own galaxy, if they live only as long as we have been around — roughly 10,000 years — then all of them are likely already extinct. And others won’t evolve until we are long gone. For us to have much chance of success in finding another 'contemporary' active technological civilization, on average they must last much longer than our present lifetime." The new study has been published in the journal Astrobiology; you can read it for free here.